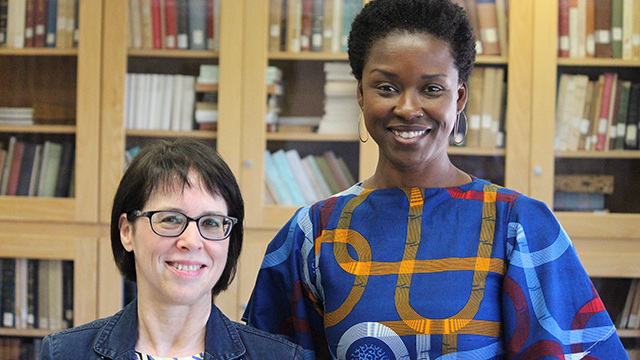 UCLA International Institute, May 31, 2018 — On May 7, Paula Butler, professor of global studies at Wilfrid Laurier University in Ontario, Canada, joined the UCLA African Studies Center for the latest talk in the center’s African Studies Speaker Series. The event was cosponsored by the department of African American Studies and the African Activist Association. Butler discussed the consequences of Canadian mining operations in Africa. Applying critical race theory to the economic system and narratives reinforced by Canadian companies, she framed their operations as ongoing economic colonialism. “When Canadian mining entrepreneurs look at the African continent, they have dollar signs in their eyes,” said Butler. She countered popular images of western-sponsored development as charitable and selfless by comparing the approximately $1 billion of annual Canadian aid going to Africa to the more than $90 billion in annual profits of Canadian mining companies operating on the continent. Despite being enormously profitable for their foreign benefactors, these foreign-funded mining operations cause a great deal of trouble for local populations. “There are a host of [human rights violations] associated with the Canadian mining presence,” said the speaker. These include forest displacement, displacement of residents without adequate compensation, environmental damage to water sources, ill-health effects from pollution, sexual violence and death and injury resulting from conflicts between local protesters and mine security. One Tanzanian government referenced by Butler concluded that 74 individuals had died in conflicts with mining security forces at one specific mine site. These protests are largely driven by resentment of Canadian companies’ ability to extract local resources and send large profits back to Canada, while negatively impacting local quality of life and the livelihood of artisanal miners. As Butler sees it, these small-scale conflicts over mine operations are an extension of the long-standing dynamics of colonialism. “Applying critical race theory enables us… to focus on how mining as a mode of white supremacy continues to racialize bodies based on phenotype [an individual's observable characteristics], such that individuals are differently positioned, included, excluded, protected or criminalized based on race,” she said. The actions of Canadian companies are also founded on racial dynamics. Butler explained that the Canadian mining industry perpetuates racist narratives by painting African citizen miners and artisanal mining projects as inept, ineffective and a roadblock to development. In reality, her research found that while industrial mining increases the gross domestic product (GDP) of countries, the profits are largely enjoyed by bureaucrats and lawmakers, whereas small-scale artisanal mining allows profits to flow to the poorest sectors of society and the working class. Many artisanal miners face targeted legal charges orchestrated by foreign companies, said the speaker, such as allegations of child labor practices and unsafe mercury use. Such charges are not, however, leveled at Canadian companies, which often employ more severe and unsafe workplace practices and experience near constant eruptions of violence on mine sites due to conflicts over land. Butler argued that the disproportionate targeting of local miners is both symptomatic and protective of racist, white supremacist structures of colonialism — structures that also permeate our lives in North America. Butler’s connection to the Canadian mining industry is personal. Her father worked as a deputy mine manager on the east coast of Canada during Butler’s childhood. Prior to completing her Ph.D., the speaker worked in human rights advocacy and the international civil society sector across the African continent. “The solid working-class livelihood that my immediate family enjoyed was derived from access to land and mineral-rich territories from which indigenous peoples [had] been displaced,” she said. “The racist ideologies and colonialist capitalist practices that made this possible for my family similarly made possible the resource exploitation that occurred in African countries throughout the formal era of colonialism, just as they make possible the contemporary Canadian exploitation of African mineral wealth today,” she continued. Structural adjustment policies put in place after the Cold War enable Canadian mining companies to funnel profits from Africa to Canada, according to Butler. Trade laws beneficial to western interests were written to attract foreign investors, following counsel from the World Bank and western corporations. “Canadian organizations draft mining laws and meet with African lawyers, while publicly pushing for ‘good governance’ in aid programming,” Butler explained. “But when it comes to actual parliamentary debate or civil society input into [their] predatory mining practices, there’s no support,” she said. In Butler’s view, structural readjustments to the economies of African nations in the past 30 years, together with the suppression of mine-site protests and exploitative mining operations, are best understood as part of an ongoing effort to maintain Western economic hegemony of resource extraction on the continent. “African people, African politics and African aspirations to enjoy the value of their resource wealth are treated [by Canadian mining companies] as background irritants to be dealt with as efficiently as possible,” concluded the speaker. In order to properly dismantle this system of economic white supremacy, Butler urged students and researchers to be aware of the discrepancies between aid sent by western countries to the African continent and the profits western companies reap from natural resource exploitation in the same places. In addition, she advised attendees to consider employing critical race theory in their work, to think critically about their own privilege when studying development and resource extraction, and to consciously seek out media that challenges neo-colonialist practices abroad.